The assassination of the heir to the Austrian-Hungarian throne led to several complex alliances, formed over previous decades, being invoked. Within weeks the major European powers were at war both in Europe and worldwide via their colonies. The Austro-Hungarian alliance declared war on Serbia on 28 July 1914. In August Germany invaded Belgium and Luxembourg (with the aim of getting as quickly as possible to Paris) and opened up the notorious Western Front. Britain declared war with Germany on 4 August 1914. America stayed neutral until 6 April 1917. The First World War was played out not only across the notorious areas of Western and Eastern Europe, but across the Balkans and further afield in the Middle East and elsewhere. The Western Front was the most infamous of all the fronts in the First World War. 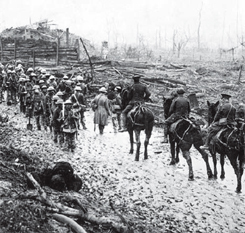 The Western Front stretched 440 miles from the North Sea in Belgium across France to the Swiss border. Despite the many offensives, the line of trenches, dug-outs and barbed wire moved little in this time. These offensives employed massive artillery bombardment and massed infantry advances. However, a combination of machine guns, barbed wire and artillery repeatedly inflicted severe casualties on the attackers and the counterattacking defenders. Four major empires – the German, Russian, Austro-Hungarian and Ottoman Empires – were defeated and ceased to exist. The Russian Revolution in 1917, led to the cessation of the war between Russia and Germany with a treaty in early 1918. This international body was created in the hope of preventing another conflict. However, European nationalism particularly in Germany, the break up of empires and other economic problems led to the Second World War in 1939. More than nine million people were killed in The First World War.